The NZTA also published this video which includes Transport Minister Simon Bridges praising the project. 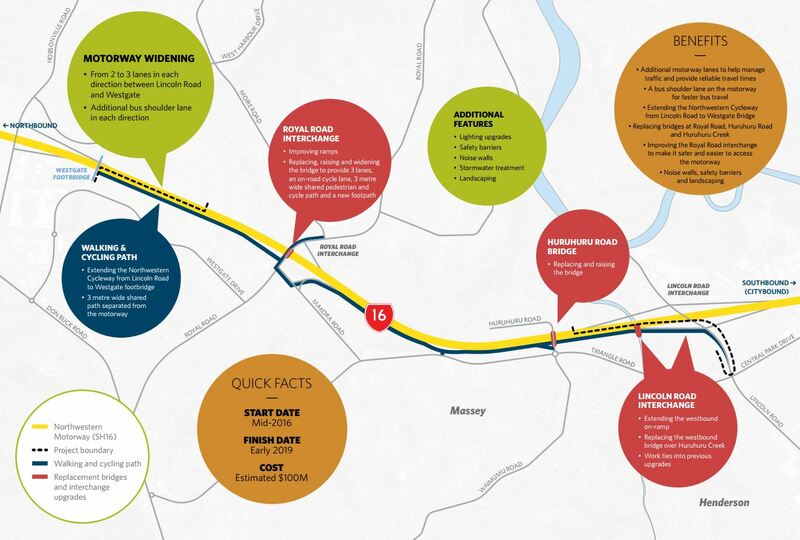 As mentioned, this $100 million project is widening SH16 between Lincoln Rd and Westgate includes: adding more motorway lanes, some bus lanes, a cycleway as well as upgrading the Royal Rd interchange. Some of the work was originally meant to have been done as part of that the over budget Lincoln Rd interchange project. The cycleway will be a useful addition, mainly because it will be at a nicer grade than the local road alternatives. I currently ride through this area when going to/from work on the North Shore and the local network options drop below the motorway before rising up above it creating some very steep streets to navigate. 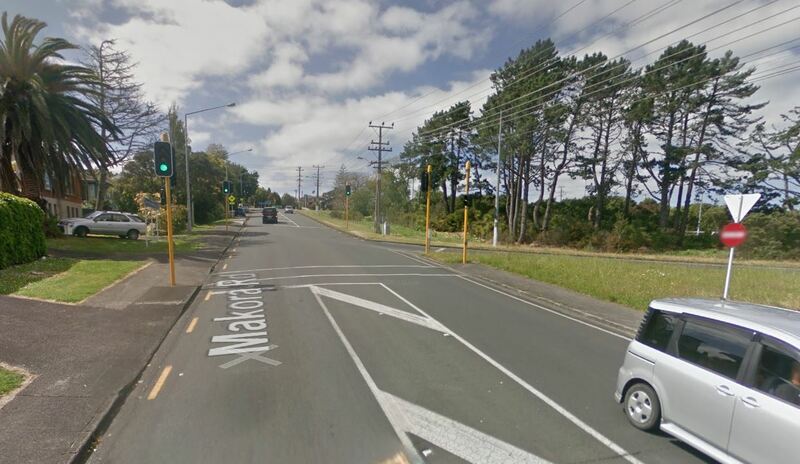 But while the cycleway will be useful, the NZTA will force cyclists off at Royal Rd interchange, up a steep section of Makora Rd and through the intersection with Royal Rd. Given the grades, a simple underpass of the off-ramp seems like it should have been easy as well as presenting an easier grade for cyclists. Bus shoulder lanes are being added to the motorway. While this is definitely an improvement it’s not the dedicated NW Busway that we need and buses heading further west will be forced to merge out of the bus lane at the Royal Rd interchange. That means to get a proper busway in the future we’re going to have to go back and widen the motorway further, likely taking homes and probably rebuilding the cycleway again when it could have all be integrated at the same time. 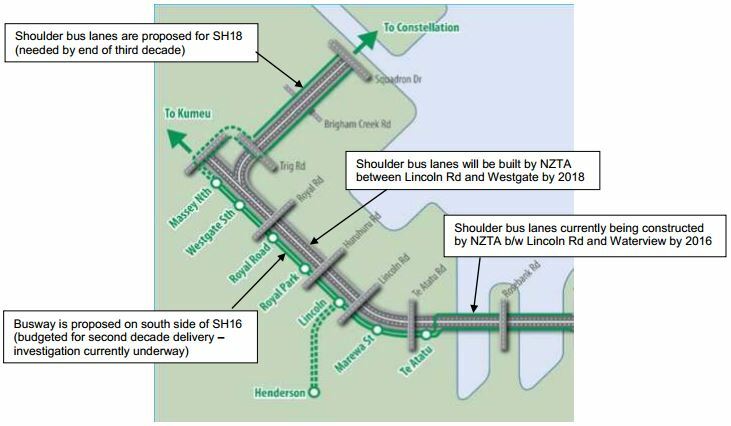 I recall that back when the NZTA were consenting Waterview and the causeway, they used the excuse that the former ARC plans didn’t list that section of SH16 as a rapid transit route as to why they weren’t including a busway. But those same plans did list Henderson to Constellation via the motorway as a future RTN route as one so it seems the NZTA pick and choose which of the plans it listens too. 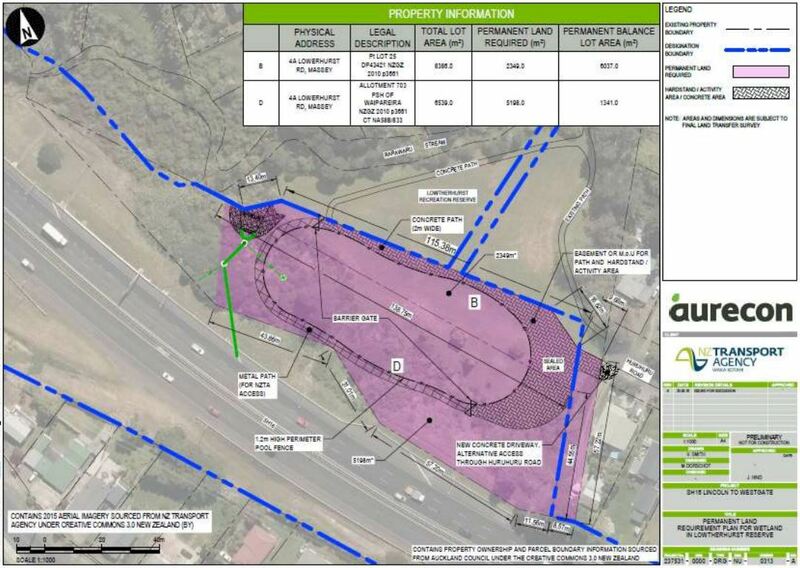 There’s another feature of this project the NZTA have not said a single word about, that they’re taking 7547m² of land from a local reserve under the public works act plus another 1666m² as an easement for access, all of which is hidden under the brief bullet point above of Stormwater treatment. Information on the NZTA’s plans for Lowtherhurst Reserve are detailed in the agenda to the Henderson-Massey Local board at the beginning of April and the land they want for a stormwater pond is shown below in pink. The land in question is also what can be seen in the background of the video above. The reserve is almost 44,000m² but most of that is steep and covered in bush. Only about 14,500m² is flat and grassed so the NZTA want to take half of that. I know somewhat well as I ride through it as part of my commute. B. the development and use of a wetland walkway and multi-activity use area for the local community with Auckland Council maintaining the footpath and multi-activity area at an ongoing cost of $500 a year (this will be cost neutral as there is a cost saving of $555 from reduced mowing on the reserve resulting from the divestment of land). More detail on each of them is provided in the report but the minutes show the local board supported selling the land and chose option B. They’ve also requested the money received by the council for the sale of the land go to other open space priorities in the local board area. According to the NZTA website, the project is due to be finished in February 2019. Could they have not just widened the carriageway like a couple metres more and then just put a median busway in? NZTA’s view of Public Transit; basically never. Am reminded of Keynes’ famous retort: ‘in the long run, we’re all dead’. Please can we have a New Zealand Transport Agency instead of this highway builder. At best, incompetent, at worst, negligent. Its astounding the Northern Busway can be such a resounding success, while at the same time there be active resistance to replicating it anywhere else. People at the NZTA decision making table “The west already has a rail corridor, they don’t need a busway too”. more traffic lanes, additional bus lanes, upgraded structures and upgraded cycling facilities. That looks like a great project and will improve this section of the state highway significantly. Looking forward to this being finished. I’m all for “best not being the enemy of better” but looking at this in detail, there is a fair bit of PT/cycle-wash.
‘end of the third decade’ amIright? They’ve cut a corner for car users – still no ramps for those wanting to head north or east, forcing more traffic to use local roads to access the nearby town centre or North Shore employment (to the detriment of cyclists). Been driving through roadworks on the NW since the 2010 Lincoln Road project started. 2019 will mark a whole DECADE of chaos and inconvenience. Why can’t they do more of it at once and finish sooner? And get it right first time (I’m looking at you bus way!)? Having been bludgeoned into putting cycle underpasses at Te Atatu Rd and Patiki Rd NZTA have done a pretty good job and I can ride nearly all the way from Lincoln Rd to Wellesley St away from cars. I’m generally happy to ride amongst vehicle traffic, it’s just much more pleasant not to have to. So please, please NZTA do the decent thing a put an underpass in at Royal Rd and while you are about it, one at Lincoln Rd and St Lukes Rd. The cows in this country get higher priority than active modes. And I’m with MeToo and have just enjoyed a couple of months of improving travel time on the North West and it’s about to stuffed up again – for three years for a km or so of roadworks. Appallingly slow. Agree, cycleway needs a grade friendly underpass of the Royal Rd offramp, and then should continue under the Royal Rd bridge. Who do we need bludgeon in order to make this happen? Is there a partition being organised? Similar treatment at Carrington Rd should have been part of the motorway widening. Its time for state highways in Auckland to become the responsibility of our local government. The crown doesn’t’ understand what Auckland needs and never will. Hell no. The last thing we need is for Auckland Transport to be given any more authority. If anything we need to get rid of them. I thought that land at Lincoln Road was planned for a bus station or was it the other side of Lincoln Rd? Weren’t places secured for bus stations in Te Atatu and Royal Rd? Royal Road to Westgate was massively widened in 2009-2011, basically doubling in width. Now they are rebuilding it again? It would be nice to see some forward planning that gets things right the first time. John Key’s tweet states this is the last section of the western ring route. I guess that means the nats have cancelled their SH1/18 $500million “making the map look pretty” works. It’s ridiculous they want to go ahead with this now, without just building this section of the NW Busway at the same time. Surely there would be economies of doing the two projects together? Bike Auckland was told the potential for a cycleway (shared path) underpass at Royal Rd conflicts with the future planning for a busway – which was also the reason given for no underpass at Lincoln Rd. It is sad that there is this continual conflict-of-use argument between self-propelled, motor vehicles and public transport when good planning might encompass all three modes. It also worth pointing out that now the central city rail loop is happening, light rail might be a better option than bus for the NW corridor, with perhaps a NW dual track outer loop continuing on from Westgate to Join the existing main north line at Taupaki. This would cater for the vast new dormitory suburbs that are springing up on those beautiful western fields. Sort of feels like bus and bike cancelling each other out; fighting over the scraps once they’ve used all the space and blown all the money on the already over-served mode.